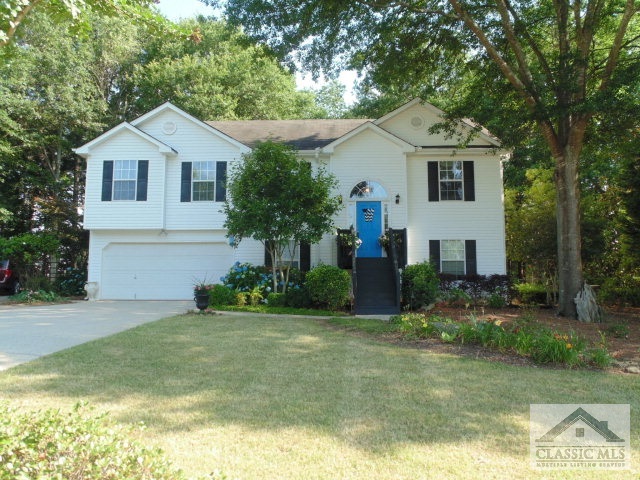 Cozy 4BR/3BA Split Foyer with Curb Appeal! Additional Parking Available for RV, Boat, etc. Professionally Landscaped, Private Backyard, Fenced with an Out Building. Deck with Steps that lead to the Backyard Oasis w/Firepit for Entertaining Family and Friends! Two-story Foyer Area leads to an Open Floorplan with Vaulted Ceilings, Beautiful Hardwood Floors and a Wood Burning Fireplace! Separate Dining Rm Area and Updated Kitchen has View to Living Rm. All Kitchen Appliances are included. Alarm System Installed. Split Bedroom Floorplan offers the Master Suite secluded on one side with 2BR/1BA on Opposite Side. Downstairs area offers a 4th Bedroom and Full Bath, along with another Living Area with Lots of Built-in Shelving. Also on Lower Level is an additional Storage Rm and 2Car Garage with Workshop Area. Must see this Move-in Ready Home! Call Today for an Appt! Eastmont is a subdivision within the city of Winder, Georgia. There are currently 0 Homes for Sale within Eastmont, with asking prices ranging from $0 to $0. The average list price per square foot of the available inventory in Eastmont is $0, which is the Winder average of $217. The Average Sales price of all sold real estate in this subdivision for the past year is $180,000. Recent comparable homes have been selling for 97.56% of their asking price. Waterfront homes represent of the available Eastmont inventory. The population of Winder, according to the 2010 Census, is 14,099. The total number of households in the zip code of Eastmont is 13,259, with an average household size for of 2.84 people. The total number of renter households within the zip code of 30680 is 3,620, which means that 72.70% of households in this zipcode are owner occupant households. 817 Eastmont Rd, Winder GA 30680 is a Home, with 4 bedrooms which is recently sold, it has 0 sqft, .51-1 sized lot, and Drive Under,Garage,3+ Parking parking. A comparable Other, has bedrooms and 0 baths, it was built in and is located at and for sale by its owner at $ 0. This home is located in the city of , in zip code , this County Other, it is in the Subdivision, and Bellingrath Plantation are nearby neighborhoods.